At afaqs! 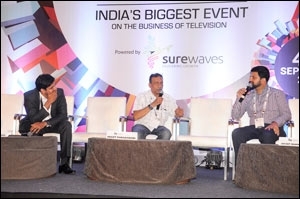 TV.NXT 2014, Vidya Nath chats with Sanjay Salil, Vynsley Fernandes and Shyatto Raha as they take a look at the size, shape and contours of a new business opportunity. There is a growing demand for Indian knowhow to set up, operate and run channels in markets such as Africa or Central Asia, that are at similar stages of development. And a slew of Indian firms are providing that expertise. At afaqs! 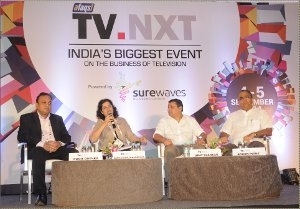 TV.NXT 2014 Vidya Nath (research director - global innovation centre, digital media practice, Frost & Sullivan) chats with Sanjay Salil (MD, MediaGuru), Vynsley Fernandes (director, Castle Media) and Shyatto Raha (CEO, NDTV Worldwide and ED NDTV Ethnic Retail) as they take a look at the size, shape and contour of this new business opportunity. Nath started off by saying that Indians are international exporters of shows like 'Kaun Banega Crorepati', 'Comedy Nights With Kapil', 'Saravanan Meenatchi', 'Bhauji No1' and have come a long way and continue to be popular in any region around the world. "Many are unaware of a silent revolution that has been taking place over the last few years, where a few companies have been at the forefront of setting up media businesses, TV businesses, TV channels, TV ecosystem and even entire digital strategies for media companies in different parts of the world. Is there an opportunity beyond programming overseas?" Nath asked. Salil answered in the affirmative, adding, "Only if that reflects in revenues and profits." He believes that this opportunity exists not just in Africa or Central Asia but across the world, even in Europe, America and not just in TV, but in different sectors of media, in the entire media process outsourcing business. So what are the services that can be offered? Is it just technology evaluation? Fernandes explained that if one is looking at the media services industry overseas, he needs to draw a matrix. There are developed nations like America and Europe, and parts of Australasia (Singapore and Hong Kong); the second rung markets which are in the process of developing, a part of which is also India; the third are those countries which are in the process of going digital like Trans-Saharan and Sub-Saharan Africa. "The services these markets are looking at are quite diverse. In Europe, for instance, an assessment for over-the-top (OTT) platform would be the key driver or converting content from tapes to digital (digitisation) format. Because there is a strong arbitrage. If you look at the Euro, Pound or Dollar vis-a-vis the Rupee, the arbitrage factor is pretty resounding. Further, if you come down to Africa, the business is to help them understand how to launch a channel," Fernandes adds. He mentioned that India is the only country with over 300 news channels and therefore, in the process of setting up a channel, there is an inherent expertise involved. "So Sub-Saharan Africa is looking at Indian expertise to help them set up the digitisation system. Also, the cultural aspects are pretty similar," he adds. Media consultancy is not everyone's cup of tea. A media consultant should be able to forsee what industry has in store much before others do. Raha elaborated that having done it for two years, he realised that if his company wanted to grow horizontly, it needed to be way ahead of broadcasters, content providers and platform owners in terms of being able to forsee where the industry is headed. "Broadcasters, content providers and platform owners require digital strategies, and we see that space as next big future. We are already in the process of setting up OTT platforms in the markets we operate in and are looking at setting up mobile platforms for content providers, but the bread and butter of setting up channels and managing them is still there," Raha added. Echoing what Raha said, Salil went on to add, "Yes, that's the bread and butter. But you have to go much beyond that. Most of our business does not come from just selling the idea, giving service but recommendations too - which only happens when a client is happy and satisfied." What keeps media consultants awake at night is that they are playing with other people's money. So, there is a need to be very careful otherwise it just takes one project to go wrong to ruin the reputation and hard work put in. Reputation and track record is also something that makes a foreigner trust an India compay. "Contary to common belief, the technology that India has deployed for its TV stations, whether it's news or entertainment or music, is actually up there with the best. If you look at news channels, private ones like Aaj Tak, NDTV went tapeless in 2002. On the other hand, Fox News in the US which had probably around 12-15 years of headstart went tapeless in 2008-09 only. 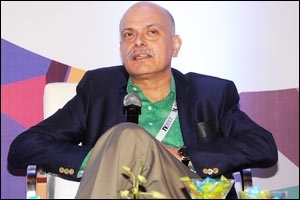 So, we have the capability to leapfrog," Fernandes opined. 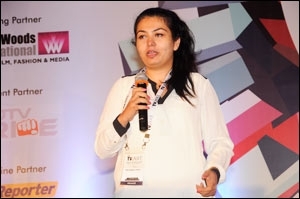 According to Raha, what makes Indian firms attractive is that we are a very young media industry that has grown rapidly. "One of the main reasons is innovation, be it in terms of content, branding, technology (from cost efficiency perspective). When foreigners compare us with a Chinese consultancy firm or the Western ones, the adaptability and innovation that Indian media consultancy firms bring today is unparalleled." Another important thing while pitching for an overseas market is that the company needs to understand the cultural nuances of the particular region. As is the need is to find the right talent to do the job better than anybody else. TV.NXT 2014: Is There a Need to Redefine Journalism in the Online Era? 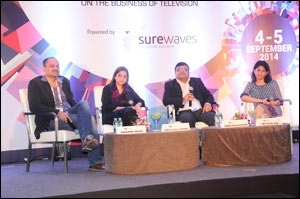 TV.NXT 2014: Are we in the age when TV business will be redefined?